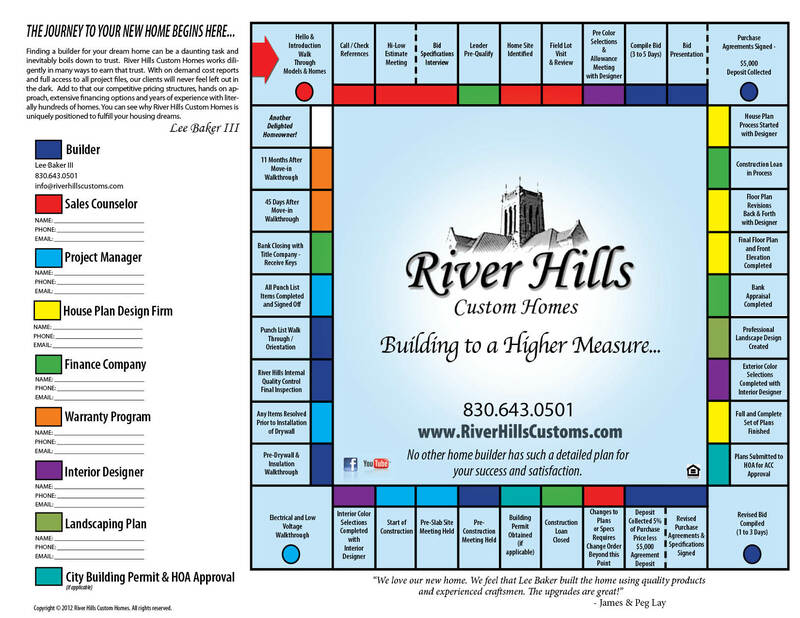 The River Hills Journey represents a step by step plan guiding our clients from the day we meet them to the end of their one year warranty. This is intended to minimize surprises and ensure that everyone is on the same page about what is coming next in the process. Clients often enjoy checking off the steps of the design build process as they approach the finish and moving into their dream home. Don’t settle for a black box building experience! 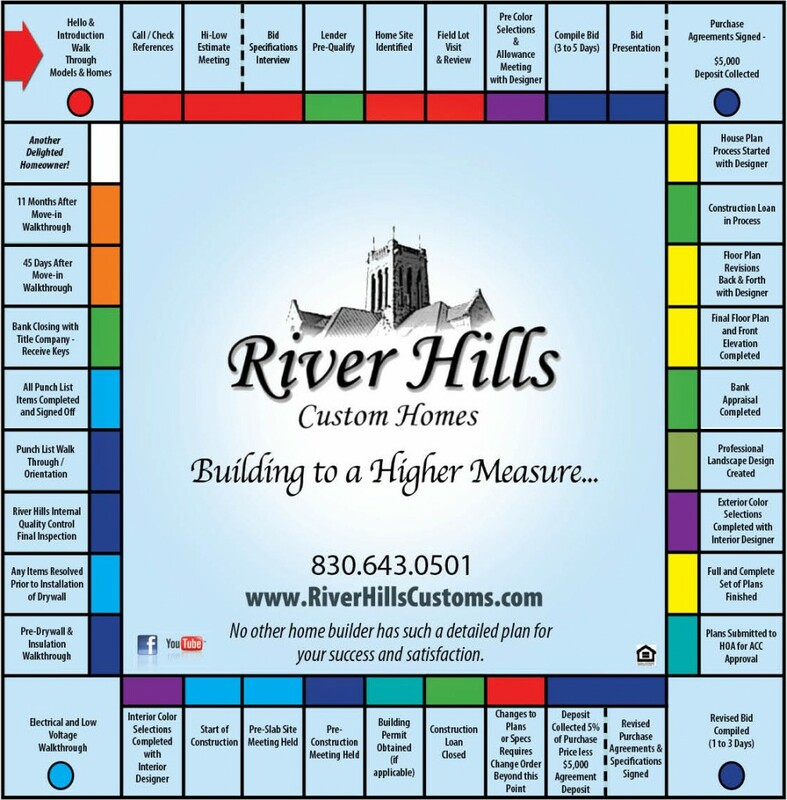 At River Hills Custom Homes we want your trust and we are more than willing to show you that we have earned it. We believe that above all, integrity is of utmost importance. Adding to that an understanding that we are here to serve and to provide our clients with the most value possible, we understand that the investment in your dream home is a major financial commitment. This is why we have come to the belief that our clients should have full access to all information associated with their home. During all phases of construction our clients are provided with full access to the digital files associated with their home. This is possible because River Hills Custom Homes is a fully digital, paperless business. Once the home reaches completion our clients receive a CD comprised of all digital files produced during the construction of their home. Know where your money is going! At River Hills Custom Homes our clients are provided with line item bids before the contract signing. Once construction has begun job costing reports that show exactly where every dime is going. This allows our clients to track the progress of their build and adds yet another level of trust. Its your money! You deserve to know where it is going! Rest assured your covered! Proper paperwork management is just as important to the building process as is quality of workmanship. Our clients can trust that their interests are being vigorously guarded! Every home we build is covered by an extensive builder’s risk insurance policy that protects your investment during the build process. Every subcontractor that works with River Hills Custom Homes is required to provide us with 1 million dollars of general liability insurance in the form of an additional insured certificate. This creates an incredibly large multi-million dollar umbrella for every one of our clients. Before any payment is made to any subcontractor they are required to sign an extensive lien release form. this protects our clients title to the property and is a vital part of the protection and attention to detail paid to the interests of our clients. Our subcontractors are also required to sign workman’s compensation releases before payments are issued. This is yet another layer of liability protection for our clients.